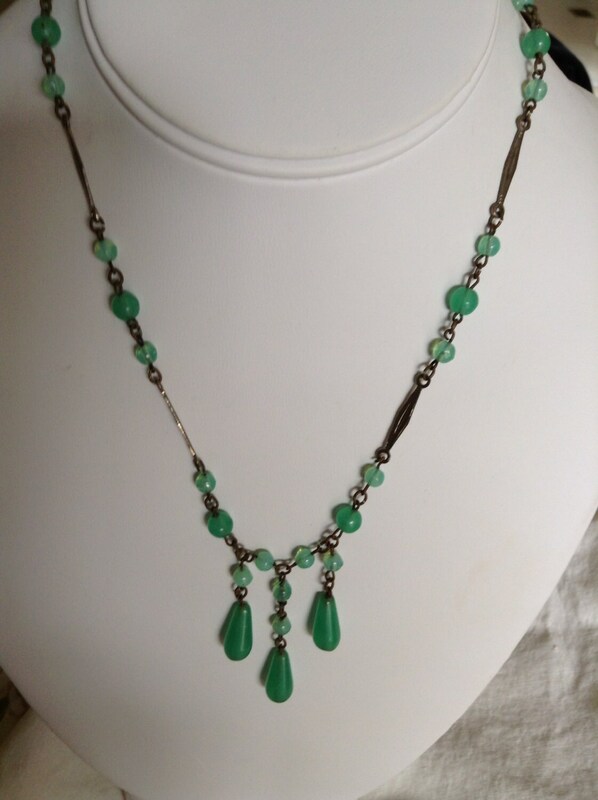 1930's, 16 long apple green glass three pendant drop necklace. 1930's, 16" long apple green glass three pendant drop necklace. 1930's, 16" long apple green glass three pendant drop necklace. on a silver toned metal chain. 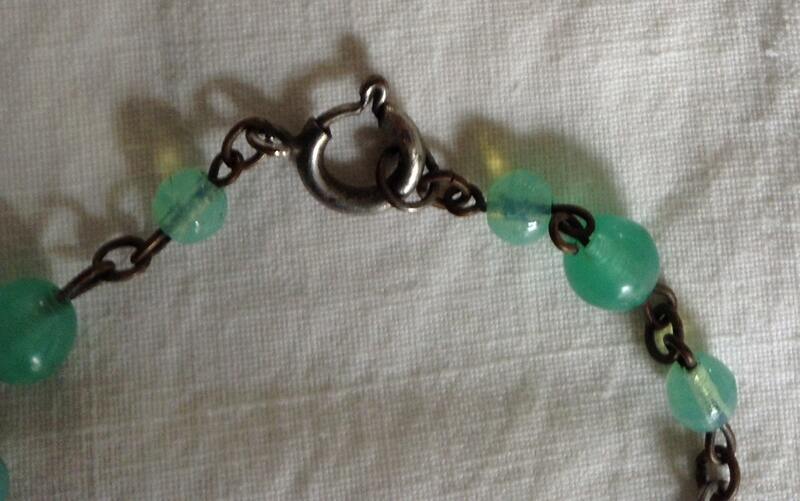 Smaller, lighter green round beads are spaced between drops. We accept the very easy to use PayPal. Also, if you seem to be having trouble navigating the site to accept payment or a refund please always know we can send a check to refund if that is the easiest route for you. We also gladly offer a layaway plan. The purchased item must be paid in a timely basis and be completely paid off with in 30 days of the purchase. The item will not ship until we have received the full payment. A 20% deposit is required to hold the item. If not paid with in the 30 days the item goes back on sale and the deposit is non refundable. Our shipping is priced out as a flat rate. If the shipping that is priced turns out to be significantly more then the actual shipping cost, then we will gladly refund the balance. When an item is shipped that requires a padded envelope a $2.00 padded envelope will be purchased and this cost is included in the shipping cost. In addition a $2.00 handling fee will also be applied. In turn if an item turns out to be more costly to ship I will get in touch with the purchaser and an additional cost will be incurred as to cover the shipping properly when that extra cost is received the item will be shipped out. We are so happy to have International shipping available. That being said our shipping prices are priced for First class mail International. Please be aware that this is the cheapest way to ship internationally and therefore has very limited tracking ability, no insurance (although a lost package is very rare), and can take longer to arrive. If you would like us to ship out Priority International which will arrive in 6-10 business days and has full tracking capacity but is about $20-$30 additional to the first class international shipping charge let us know in a message. If you do prefer Priority international I will let you know the additional amount that is owed based on your purchase, it will be an extra charge and we will ship the item out when we receive full payment. If you are unhappy with your purchase from Eva Wagenfish for whatever reason, the item(s) must be returned within 10 days from date of shipping for a refund. The cost of the garment will be refunded in full. Cost of shipping is not refundable. If an item is lost we will try to solve and locate the item, but in those cases that it is unable to re-obtain the item a full refund will be issued. We here at Eva Wagenfish Emporium strive to price our carefully selected vintage and antique treasures at a very good rate and we want to make sure you the customer gets the very best deal! If conditions are near perfect we label them: Very Good. We strive to announce and make clear all details of each garment including points of love (mendings, etc. ) on vintage wear. Since we are human and working in some cases with Baby Boomer eyesight. There are some cases that we may miss something. But please know we check and recheck and recheck again to insure that we communicate clear descriptions.